A fear of needles is a reality for many children during a hospital visit. Recent award recipient, Dr Evelyn Chan is helping to change that. Dr Evelyn Chan has taken out a coveted award for championing the use of virtual reality (VR) in hospital settings. The BioMelbourne Network Women in Leadership Awards are designed to celebrate, honour and profile successful women in the health industry sector. The 2011 Rhodes scholar and doctor from Melbourne has been dubbed a 'doctorpreneur' for inventing an Australian first: virtual reality headsets to improve the experience of children undergoing needle procedures. The headset, or goggles, depict an underwater adventure that children can engage with to reduce their pain and anxiety. Her invention is named Smileyscope, and Evelyn is the CEO and co-founder. 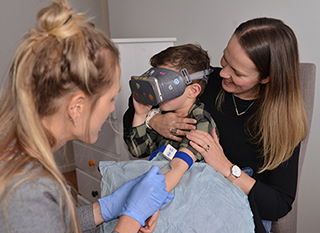 The result of two years research and development, Smileyscope is currently in operation in 20 hospitals across Australia and the US: you’ll find the device being used in Victoria at Monash Children’s Hospital, Royal Children’s Hospital, St John of God Berwick and Ballarat. The plan is to expand the program to Canada, the UK and Singapore in 2020. "We currently have more demand than what we can meet!" says Evelyn. With astute business savvy, Evelyn negotiated with suppliers to provide goggles and phones at low cost and partnered with Two Bulls – a digital company in Melbourne and New York who had worked with Sesame Street and Disney – to produce content. "Once we had the opportunity to tell them our story, they were very engaged and excited," says Evelyn. "They understood the importance of what we were trying to do for children, and were very keen to be on board." The invention was born from Evelyn’s own clinical experience. Working in paediatrics since 2010 and having performed hundreds of needle procedures on children – taking blood, vaccinations, IV cannulation, oncology port access and stitches – she noticed children commonly reported needles to be the most feared part of their hospital visit. Then she had a lightbulb moment: to use technology to address this concern from the child’s perspective. "Using VR, patients can virtually escape the scary procedure room, and transform their experience from one that was scary into a fun adventure, using relaxation and guided imagery," she explains, also noting that VR creates a quicker, safer way for clinicians to administer needles. "When patients are anxious or distressed, they often can be unpredictable or find it hard to cooperate with procedures and this sometimes leads to a higher rate of procedural failure (such as missing the vein) and to a higher risk of needle stick injuries," Evelyn says. Reducing needle anxiety is only the first of many different procedures where VR could help, according to Evelyn. "Clinicians are already using Smileyscope with children for infusions, wound care, medical imaging procedures and dental surgery, and this technology would also be applicable to supporting adults during their procedures." Becoming a Rhodes scholar also played a role in Evelyn’s current success. "My time at Oxford engaging with scholars from diverse backgrounds and disciplines made me realise how many different, innovative ways there were to transform healthcare" she says. Evelyn’s aim is both grand and far-reaching. "It’s not just about working as a bedside clinician – there are many other important roles in the ecosystem to improve health. I’m really passionate about making healthcare kinder, more accessible and patient-centric. My dream is to make tools like Smileyscope a core part of healthcare, like the stethoscope is for doctors – technology that provides support, therapy, education and empowerment to patients." 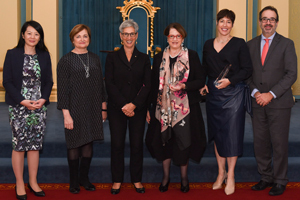 The BioMelbourne Network Women in Leadership awards are granted in three categories, acknowledging women in different types of leadership roles and at different stages of their careers. The category Evelyn has won is the Emerging Women in Leadership Award, celebrating rising stars embracing innovation, entrepreneurship and an appetite for driving change and who, regardless of age, have a high potential for future success in the industry. Discover more at the BioMelbourne Network Women in Leadership Awards website.